Buttressed by a wealth of new, collaborative research methods and technologies, the contributors of this collection examine women's writing in Canada, past and present, with 11 essays in English and 5 in French. 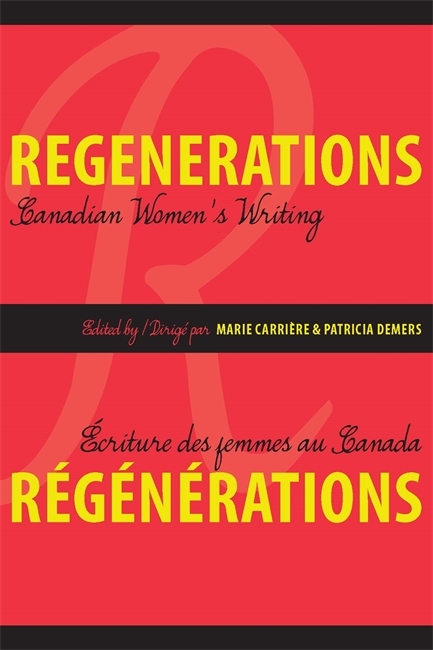 Regenerations was born out of the inaugural conference of the Canadian Writing Research Collaboratory held at the Canadian Literature Centre, University of Alberta, and exemplifies the progress of radically interdisciplinary research, collaboration, and publishing efforts surrounding Canadian women's writing. Researchers and students interested in Canadian literature, Québec literature, women’s writing, literary history, feminist theory, and digital humanities scholarship should definitely acquaint themselves with this work. Marie Carrière is the Director of the Canadian Literature Centre/Centre de littérature canadienne and teaches French and Comparative Literature at the University of Alberta. Her research focuses on contemporary women's writing and the theory and history of feminism. Patricia Demers, Distinguished University Professor in the Department of English and Film Studies and the Comparative Literature program at the University of Alberta, teaches and researches in the area of women’s writing—from the early modern period to the present.